Not necessarily endorsed by Chino Valley Quilters, but worth a look. Our site had another youth group admirer who wanted us to share a site she found to be useful for their Sewing and Fiber Arts program. Bella suggested this link. . This website has a plethora of helpful and interesting links! The Electric Quilt. Provided for users of EQ software. It has projects, challenges, problem solving and mystery quilts. Lost Quilt Come Home. Displays lost or stolen quilts in the hope that some may be returned. Includes information on protecting quilts. Quilt Festivals. Manages national quilt shows such as PIQF. Quilt University. Offers online quilting classes for students of all levels. Quilting entries at About.com. 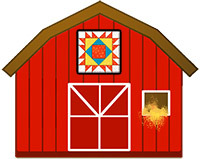 Links to other sites, includes quilting camps, instructions on dyeing, ways to find guilds around the country, profiles on quilters, galleries of quilts, clip art for quilters. Quilts, Inc. Manages quilt shows, such as International Quilt Festival at Houston. Quilts and Quilting. Educational and teaching resource about the history of quilts and quilting. Smithsonian National Quilt Collection from the National Museum of American History. Spoonflower. Design and buy custom fabric printed on demand. Check out Blog Lovin. It helps you follow all your favorite blogs, and sends notifications whenever one is updated. Official website of Jennifer Chiaverini, the bestselling author of the Elm Creek Quilts series of novels. Chiaverini has also published collections of quilt patterns inspired by the books.